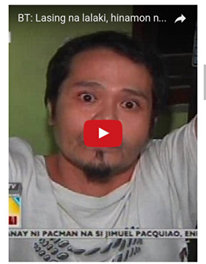 Nations Press feature news Drunk Man, Dares Mayor Duterte to Shoot Him-MUST WATCH! Drunk Man, Dares Mayor Duterte to Shoot Him-MUST WATCH! SPONSORED LINKS A viral video is now circulating on the web, showing a man who allegedly fired shots while drunk. This man is now facing several criminal charges as he challenge Pres-Elect Rodrigo Duterte to shoot him.